Hollywood Hibiscus 'Bloom Bash' as seen in my garden (2016). Enter for a chance to win your own Hollywood Hibiscus below! 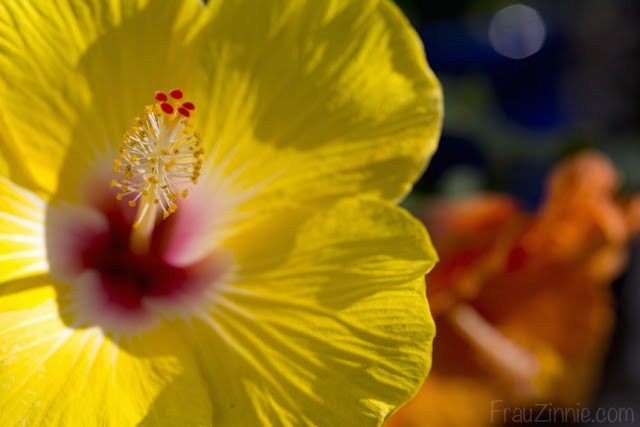 Get ready to be dazzled this summer with large tropical blossoms in vivid colors that dress up any container. 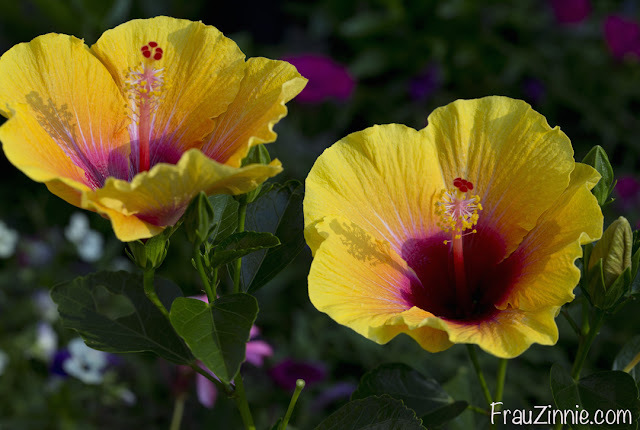 The key to creating a show-stopping planter is to include a Hollywood Hibiscus. Seen above, Hollywood Hibiscus 'Hot Shot' (left) and 'First to Flirt' (right) in my 2017 garden. 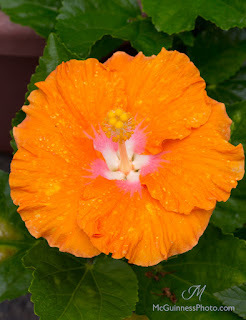 Hollywood Hibiscus 'Chatty Cathy' (2018). 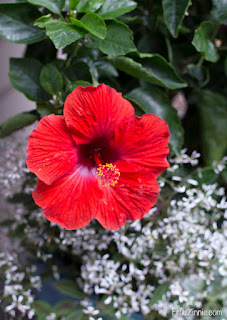 I’ve become a fan of Hollywood Hibiscus because I know they will bloom in extreme heat. Insects tend to leave the plants alone – except the bees of course. The large bumblebees in my area are big fans of the large blossoms. 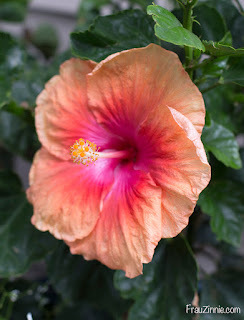 The plants also bloom for a longer period of time than other generic hibiscus you might find at the nursery. I've observed the flowers on my trial plants to remain open between two and three days. 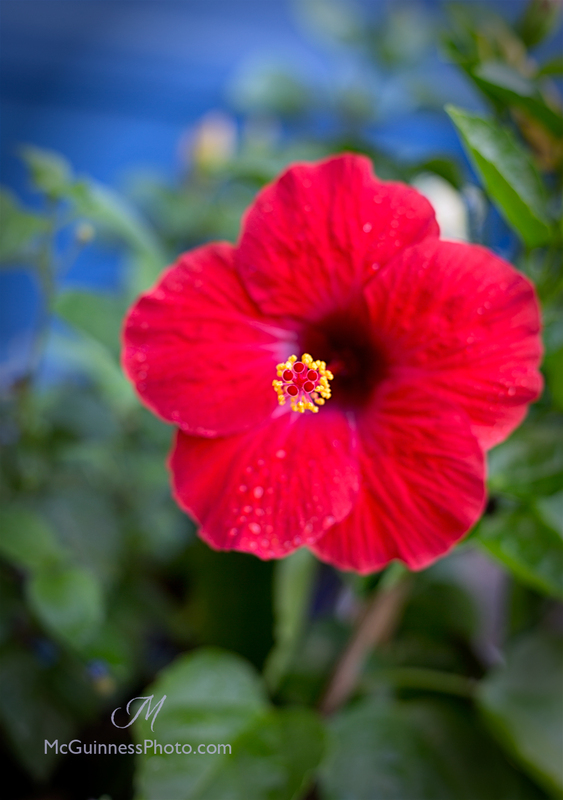 According to J. Berry Nursery (who developed the plant line) Hollywood Hibiscuses were created for high bud and bloom counts, attractive growth habits, disease resistance and vivid beautiful colors to bring low-maintenance beauty to every patio, decorative container and landscape. 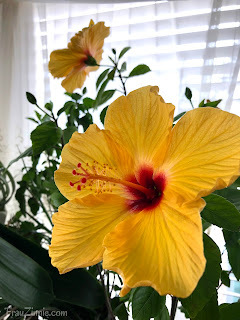 I’ve been lucky in that I’ve been a trial grower for J. Berry Nursery since 2015, and each year I overwinter the tropical hibiscus indoors so they are protected from our Zone 6b winters in Connecticut. It takes some work to make room for the plants indoors (which continue growing in size each year), but it is definitely worth the effort. Even when I kept them indoors over winter they continued to bloom (as seen at right). The new Hollywood Hibiscus website has recently been launched, and now includes an interactive quiz where you can find out which Hollywood Hibiscus you are. Are you a Chatty Cathy? Maybe a Jolly Polly? 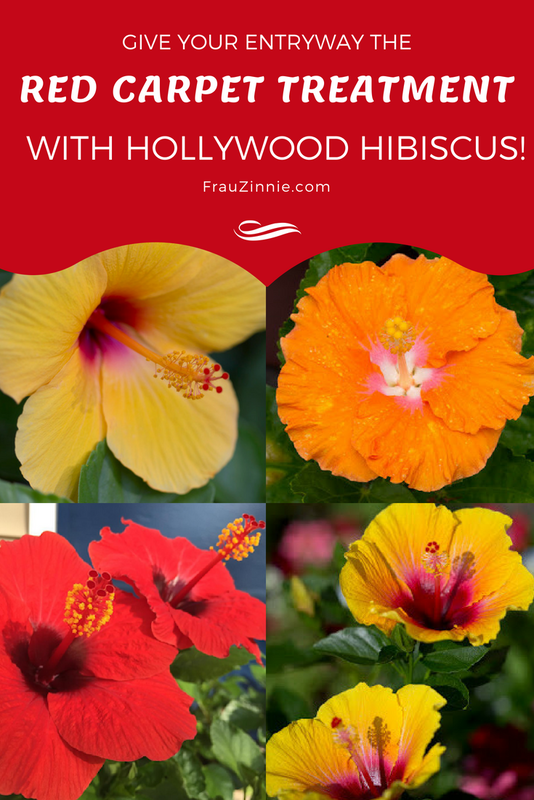 You can discover all of the Hollywood Hibiscus personalities here. As you'll see, each plant has its own persona (including Starlettes and Bombshells) and also arrives with an informative care sheet. (These care sheets can now be downloaded from their website as well, found here). Hollywood Hibiscus 'Social Butterfly' as seen in my garden (2016). This year's trial plant shipment were some of the most securely packaged plants that I have received this season – which meant they traveled from Texas to Connecticut and arrived without damage. You can use the online locator to find out which garden retailers sell Hollywood Hibiscus, or you can order select varieties from Nature Hills Nursery. Are you ready to add the Hollywood Hibiscus line to your gardening repertoire? J. Berry Nursery has generously agreed to sponsor a giveaway for readers of Frau Zinnie! You could win one (1) Hollywood Hibiscus plant (variety will be chosen by J. Berry Nursery upon shipping) with seven different ways to enter below! Win your own Hollywood Hibiscus plant! Please note: This giveaway is only open to 41 U.S. States only. At this time, those who live in California, Arizona, Hawaii, Idaho, Montana, Nevada, Oregon, Utah and Washington cannot enter the giveaway. Sorry! J. Berry Nursery is led by the father and son team of Jim Berry and Jonathan Berry, and is based in Grand Saline, Texas. Above, Hollywood Hibiscus 'Party Crasher' (left) and 'First to Arrive' (right) in my 2015 garden. *J. Berry Nursery supplied me with plants to trial for the 2018 growing season. Absolutely gorgeous, Jen! You capture them so well!! Thank you! They are so much fun to photograph! The plants are gorgeous when they bloom! Oooh I love all of these! They do really well in containers for northern gardeners like us! Wow!!! I love Hollywood Hibiscus too!! I wish I could have found more while the stores nearby carried them. I’m slowly growing my collection. Do you keep them overwinter? It's a good way to keep that collection going!